Appeared on best of 2018 lists from NPR, Bustle, and Nylon! Coyote is a dreamer and a drama queen, brazen and brave, faithful yet fiercely independent. She beats her own drum and sews her own crop tops. A gifted equestrian, she’s half dog, half coyote, and all power. With the help of her trusty steed, Red, there’s not much that’s too big for her to bite off, chew up, and spit out right into your face, if you deserve it. But when Coyote and Red find themselves on the run from a trio of vengeful bad dogs, get clobbered by arrows, and are tragically separated, our protagonist is left fighting for her life and longing for her displaced best friend. Taken in by a wolf clan, Coyote may be wounded, but it’s not long before she’s back on the open road to track down Red and tackle the dogs who wronged her. 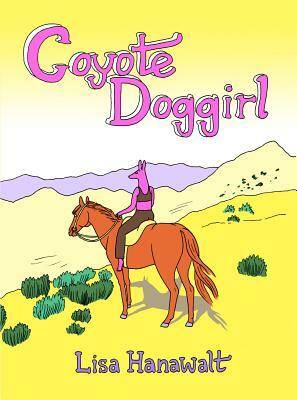 An homage to and a lampoon of Westerns like Butch Cassidy and the Sundance Kid, Lisa Hanawalt’s Coyote Doggirl is a self-aware, playful subversion of tropes. As our fallible hero attempts to understand the culture of the wolves, we see a journey in understanding and misunderstanding, adopting and co-opting. Uncomfortable at times but nonetheless rewarding and empowering, the story of these flawed, anthropomorphized characters is nothing if not relentlessly hilarious and heartbreakingly human. Told in Hanawalt’s technicolor absurdist style, Coyote Doggirl is not just a send-up of the Western genre but a deeply personal story told by an enormously talented cartoonist. From Other People in 2008, establishing her comic-making style of funny illustrated lists and anthropomorphized animals. Her first collection with D+Q, My Dirty Dumb Eyes, was published in 2013 and met with widespread critical acclaim. Lisa Hanawalt draws illustrations and funnies for places like The New York Times, Hazlitt, McSweeneys, Chronicle Books, and Vanity Fair and she writes and draws a quarterly food column for Lucky Peach, for which she won a James Beard Award in 2014. She currently lives in Los Angeles, CA, and is the character designer for and co-producer of the Netflix original series, Bojack Horseman.